A new 3D printed knee implant could change the way we move in older age, helping people to achieve a longer, healthier life. Throughout our lives the bending and contorting of our limbs wears down our body’s means of protecting sensitive joints. Nowhere is that more true than in our knees. Every time you bend down to pick something up your knee experiences tremendous pressure. Over time the cartilage and ligaments that protect and actuate your knee degrade, eventually leaving you in a position where moving your leg becomes painful. 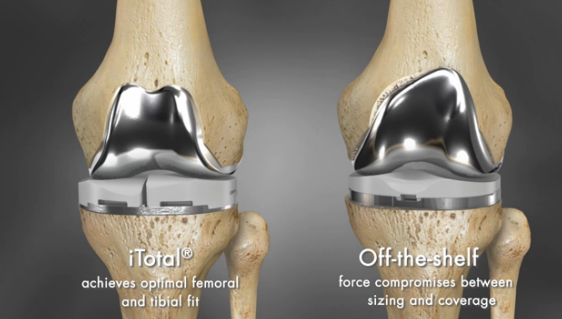 To remedy this all too common occurrence, engineers at Massachusetts-based Conformis have designed the iFit, a customized knee implant that’s more natural and precise than older off-the-shelf models. Using CT scans that analyze the movement of a patient’s knee, designers at Conformis have begun creating 3D printed metal knee implants that fit naturally into a patient’s body and reduce the amount of bone surgeons need to remove during a procedure. Because of 3D printing’s ability to create individually tailored designs, precision can be built into both the hinging and fixed surfaces of a knee replacement. With two customized surfaces built into a single apparatus, doctors can ensure that a patient will have a comfortable gait and reduce their surgical recovery time. Due to the patient specific, low run production needs of the medical industry, 3D printing seems like the perfect manufacturing solution. If a wide range of printable, biocompatible materials could be created, additive manufacturing could have a major impact on this growing sector of the global economy. Who knows, maybe one day 3D printers will have their own wing at your local hospital, churning out metal and even tissue-based replacement parts on a regular basis.